During World War II, after building several higher-end subdivisions with custom homes in such Long Island locations as Roslyn, Rockville Centre, Westbury, and Manhasset, the firm won a government contract to build military housing in Norfolk, Virginia. Here, the idea of mass-produced housing was conceived. 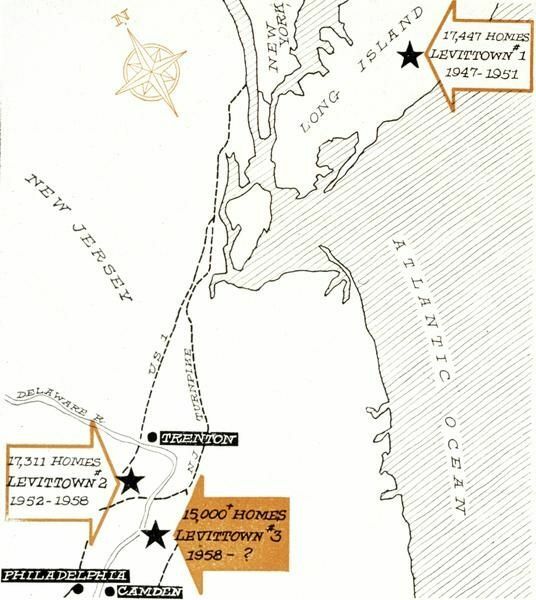 During the later war years, on the advice of Bill Levitt, Levitt and Sons bought a considerable amount of land occupied by potato farms in the Island Trees section of Long Island around the towns of Hempstead and Hicksville. 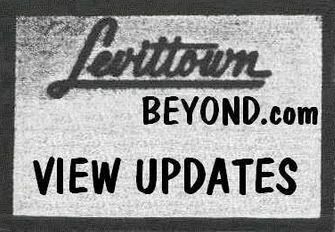 It was here in 1946 that the Levitts would employ and perfect their "reverse assembly-line" method of constructing affordable homes, in which specialized crews would move from one house to the next performing only specific jobs. 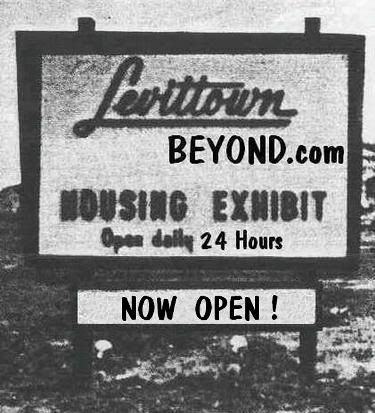 One of the original 6,000 rental units at Levittown, N.Y.
Bill served as President of the firm, and brother Alfred as Vice President and chief architect. Alfred was responsible for the compact, yet efficient, open, and felxible home plans with features often inspired by Frank Lloyd Wright's prairie style houses. 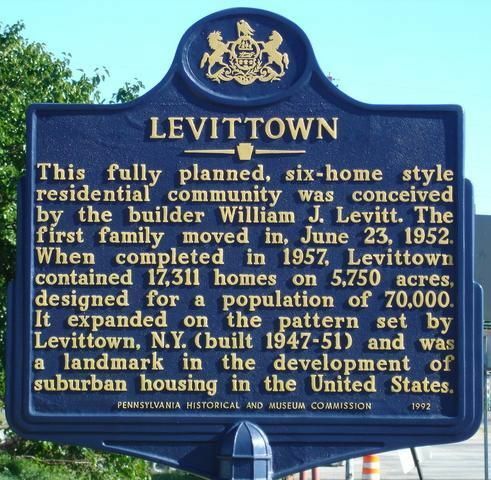 In all, 17,447 homes were constructed in Levittown between 1947 and 1951. 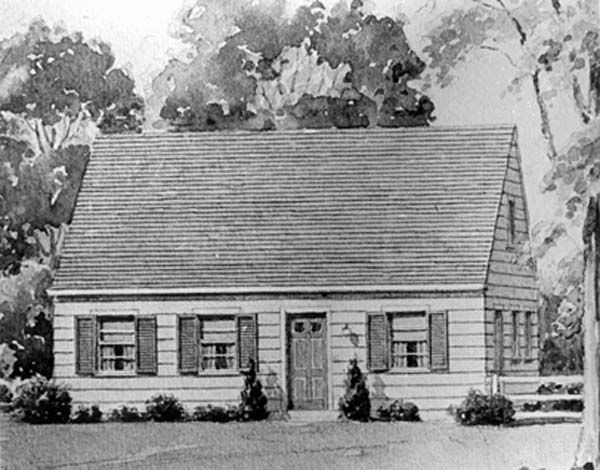 This style was introduced for sale in 1949, and was the style of the remaining 11,447 homes at built at Levittown, N.Y. Below: An actual street scene from 1951 is shown. Comparison of the 1947 Cape Cod and 1949 Rancher models. One of four elevations of this model available at Levittown, Pa.
From Long Island, Levitt and Sons moved on to Bucks County, Pennsylvania to build 17,311 homes in Levittown, Pa. between 1951 and 1958. 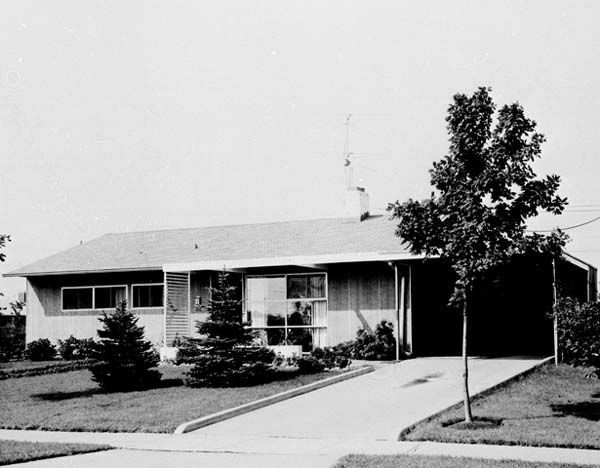 The Exhibit Center and sample homes opened December 8, 1951, with first residents moving into 67 Stonybrook Drive on June 23, 1952. 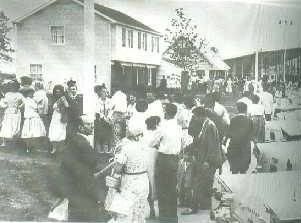 Opening Day at Levittown, Pa. Potential buyers line up to in the rain to tour the Levittowner and Country Clubber models. Not pictured is the Budgeteer model, which rented for $4 more a month than it would cost to own a Levittowner at $61 a month. Not one order was ever taken for the Budgeteer, and none was ever built, save for the sample. The last slab for Job No. 17311 was laid in December 1957. 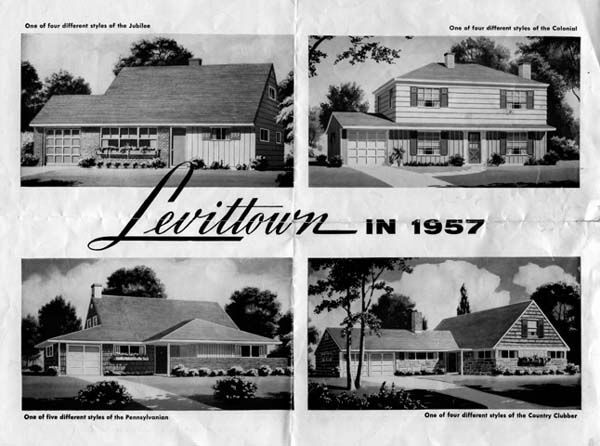 Clockwise from top left are the Jubilee, Colonial, Country Clubber, and Pennsylvanian models at Levittown, Pa. 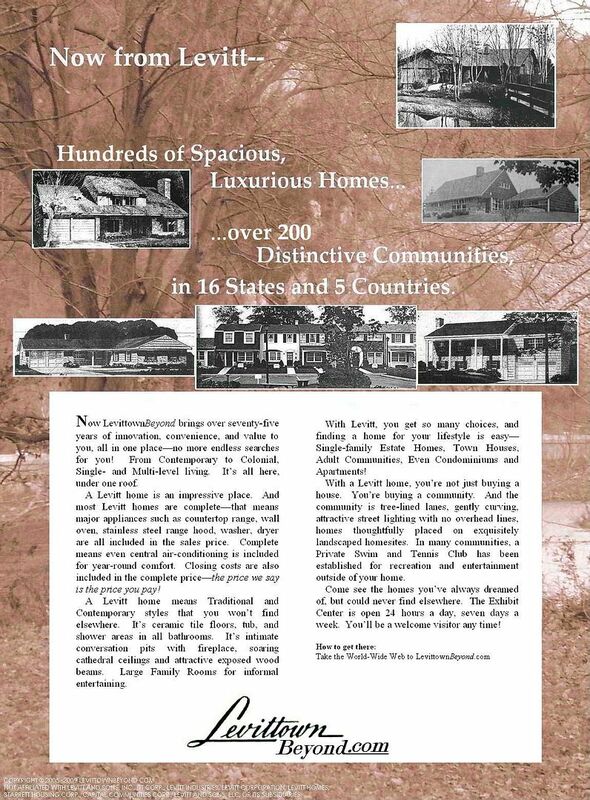 In 1956-57, a limited number of Levittowner models with 2 baths and a garage were also built in the Indian Creek section. In June 1958, Levittown, N.J. opened for sales, where approximately 11,000 homes would be built between 1958 and 1972, with an even greater variety of designs than in either of the two previous Levittowns. 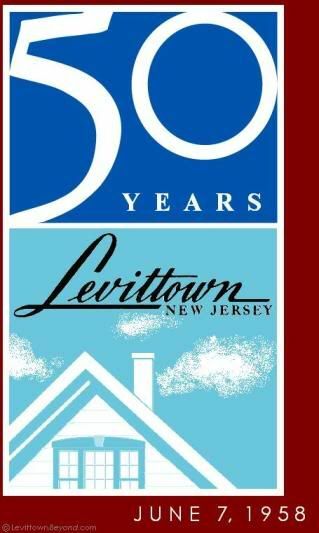 Levittown, N.J. would eventually be renamed Willingboro, but the Levitt impact remains even today. 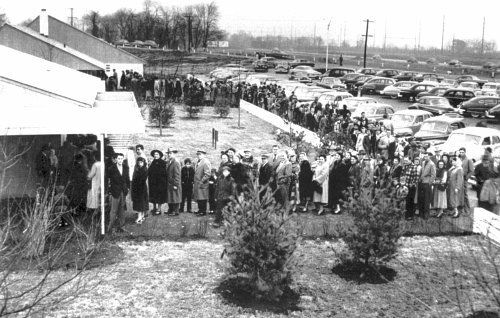 Opening Day at Levittown, N.J. In foreground, prospective buyers line up to tour the Rancher sample home. The 3-Bedroom Colonial and Cape Cod samples are shown with the Exhibit Center in the background. 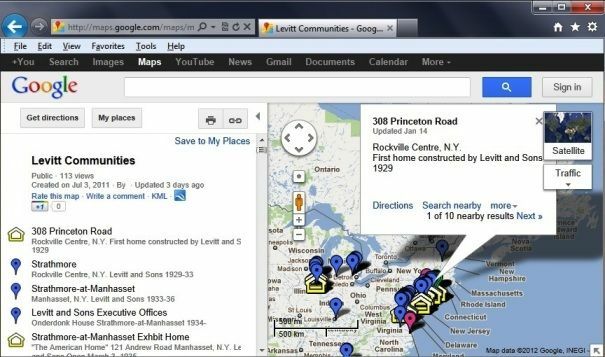 "A W E L C O M E V I S I T O R A N Y T I M E ."
YOUR LEVITT COMMUNITY IS ON THE MAP! Haven't visited in awhile? Make it your first stop on the tour! Have a question about this web site? 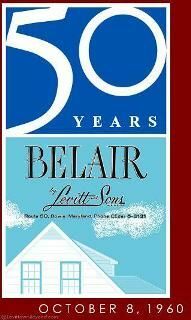 Want to know if your house is a Levitt home? Wondering which model you live in? The online contact form is now up and running!! If you have any information that you would like to share, your comments would be graciously welcomed. All information provided will be credited to the contributor. VISITING FOR THE FIRST TIME ?